This book is excellent. I like personal wartime memoirs, and once again this book proved that truth is far, far stranger than fiction. It wasn't until after Marc Stevens' father died that he uncovered the truth. His father's real name was Georg Hein, and he was Jewish. He changed his name, joined the RAF and became a pilot, then flew bombing missions over Germany (including his home city of Hanover). After being shot down and captured, he spent four years in a prison camp, working tirelessly to escape (which he managed several times) while hiding his Jewish identity. After the war he emigrated to Canada, married (still with an assumed name) and had two sons.Marc Stevens isn't a professional writer, but there is nothing amateurish about this book. It is extremely well-researched with every piece of information documented. And it is also very well-written, sweeping the reader along on the tide of events. The whole time I was reading it, I couldn't help imagining what a great movie this would make! Marc Stevens did a superb job researching his father's life and then telling the story. His father had a difficult life as a preteen boy and until he enrolled in the RAF. From that point on he grew as a person, becoming a genuine hero who fought against and was a captive of the Nazi regime. If one saw the movie "The Great Escape", much of that story was lived by Peter Stevens. Like many WWII veterans, Peter Stevens' kept his war story to himself so the author had to do extensive research. Great job Marc Stevens; excellent read. AmazingWhat a fantastic story! The author has done an amazing amount of research for this fascinating account of his late father's life. A page turner based on a true story... What a WWII adventure Peter Stevens lived and even more interesting that most of the details were discovered after his death by his son. While this book is enjoyable enough, I think the average rating of 4.73 at the time of writing is a bit over-generous!The first quarter of the 200 pages deals with routine information about flying, and his final raid on Germany. So far, unremarkable and typical of other books on the war in the air. Next we flash back to his childhood, and the increasingly difficult times for Jews, with Stevens escaping to Britain. Again, quite interesting but not very remarkable. Eventually he steals another's identity in order to join the RAF, which would not have been allowed if the authorities had known - the only unique aspect of the story.He then becomes a bomber pilot but after a number of raids he is shot down and captured, making several failed escape attempts before the end of the war - again, typical of plenty of other accounts of the war.So, readable, but not sufficiently different to deserve a very high score. Marc H. Stevens - Marc Stevens was born in Montreal in the late 1950's. but grew up between Ottawa and Toronto. He attended Trinity College at the University of Toronto in the late 1970's.From the age of 10, Marc has had a serious case of wanderlust, and has visited over 55 countries on all 7 continents. An interest in history, especially aviation in World War II, developed because of the service of Marc's father as an RAF bomber pilot in that war. Marc's dad, Peter Stevens, died in 1979, before Marc was able to question his father about the latter's wartime exploits. This led to Marc's beginning an 18 year quest, to discover exactly why his father had been awarded one of Britain's highest medals for bravery, the Military Cross.Marc had known from a very young age that his father was originally German, but he was always sworn to secrecy about that part of the family's history. What he did not know, and only discovered in 1996 (17 years after his father's death), was that Peter Stevens was not only a German, but a German Jew, who had fought for England against the country of his birth.Eighteen years of research (including obtaining access to a British government file marked "Secret - Sealed until 2051") eventually showed that Marc's father had been sent to safety in England in 1934 by his widowed mother. He had committed identity theft at the outbreak of hostilities, and was the object of a UK police manhunt while he was serving in the RAF under his assumed name. After flying 22 combat operations as a bomber pilot, Peter Stevens was shot down by flak over Berlin, and was taken as a Prisoner of War by his own country, without protection under the Geneva Convention. Had the Nazis ever discovered his true identity, they would have legally been able to execute him for treason. Becoming one of the most ardent escapers of the war, Peter Stevens actually got away from Nazi POW camps 3 times, but was recaptured each time. On one of his harrowing escapes (from a moving prison train in a hail of Nazi bullets), he made his way to his childhood home in Hannover, to get food, cash and civilian clothing from his mother. Upon his arrival in Hannover, he discovered that his mother had committed suicide in July 1939 rather than allow herself to be shepherded through the gas chambers, as her remaining relatives suffered.Peter Stevens never made it back to England until after the war, but he served for 5 years as a British spy with MI6 at the height of the Cold War, before emigrating to Canada and starting a family in the early 1950's.Marc Stevens did not start his research with the intention of writing a book about what he might find. It was simply that the story became so fascinating and so unique, that he realized he had no choice but to write a book about it. 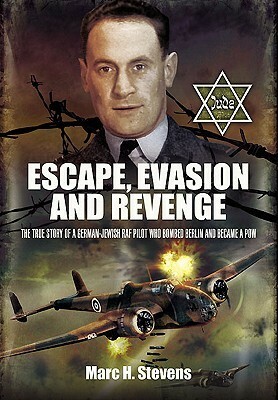 'Escape, Evasion and Revenge' is a true story of thankless and unheralded heroism.